Photograph Description: Airship experts testify before House Naval Affairs Committee. Washington, D.C. July 27. Testifying before the House Naval Affairs Committee today, Commander Charles E. Rosendahl, former skipper of the ill-fated derigible Akron and now commandant of the naval base at Lakehurst, N.J., declared in favor of a new dirigible to replace the Los Angeles. 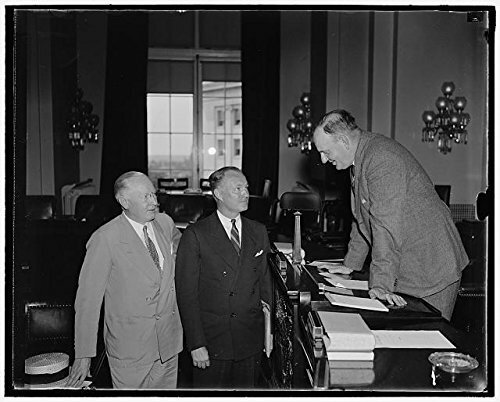 In the photograph, left to right: Dr. George W. Lewis, member of the National Advisory Committee for Aeronautics who also testified; Commander Rosendahl; and Rep. Carl Vinson of Georgia, Chairman of the Committee, 7 Published: 1937 July 27. Subjects: United States--District of Columbia--Washington (D.C.).